Sketch is a professional graphic design application for Mac computers. It can be used to create graphics and templates for websites and mobile applications. 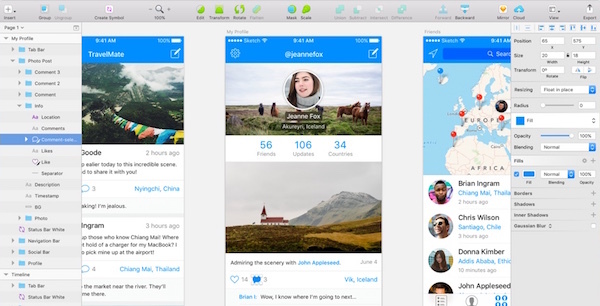 Sketch has many advanced features such as art boards, layered pages, masks and transformation effects. This program will serve as a great tool for any graphic or web designer. This tutorial will teach you everything you need to know to begin your Sketch designing journey. You will learn all the basic buttons and functions of sketch, as well as how to start new projects and export your work. This tutorial is a great place to start and can be completed in as a little as 5 minutes. You will also learn the basics of plugins and grids, and a few handy keyboard shortcuts. Once you’ve got web hosting and have to start building your website, one thing you’ll need right away is an icon set. Why not make you own icons with Sketch? This will allow you maximum creative control and ensure you have unique icons that fit your branding and theme. Use this tutorial to create your settings icon, and to learn the process of making all the icons your site will need. This is a great tutorial whether you have an interest in architecture, or simply plan to use sketch for web design and logos. That’s because this tutorial aimed at teaching you how to design floor plans will introduce you to many basic and essential tools and processes you’ll use in nearly every future project. Follow this beginner-friendly tutorial before moving on to more complicated Sketch projects to gain experience and familiarity with the application. 4. Sketch Charts and Graphs. This tutorial shows you how to transform your raw data into attractive graphs and charts using Sketch. This is helpful for graphic designers working on informative websites or marketing materials. With this tutorial you can create pie charts, circular displays for data comparison and plotted line graphs. 5. Scalable Shapes in Sketch. If you’ve worked with any graphic design software before then you’ll know the frustration involved in scaling objects upward. Borders tend to become blurry as pixels fall out of alignment and you can end up reducing the overall visual quality of your work. Use this tutorial to overcome this common problem and create completely scalable web graphics. 6. Text and Shared Styles. One of the best parts of working in Sketch is the versatility it offers for creating text and coherent shared styles. You can use this tutorial to become a master at implementing text areas and maintaining coherent styles among you various design elements. This tutorial will also show you how to decorate text with gradients, drop-shadows and other effects. This thorough how-to style tutorial for Sketch will teach you the process of making a pattern library to use on all your future Sketch App projects. These patterns are typically used for interface elements, such as nav bars, buttons and interactive menus for websites and online apps. Once you have a pattern library built up you will shave time off all future projects and save yourself from redundant design tasks. Logos are an important part of branding, especially on the web. Since you will use your logo in many places including on your website, marketing materials, and perhaps as a watermark over your images, it’s important that it’s scalable. Vector images make the best logos because they have good compression ratios and are easily scalable. They are also capable of transparent backgrounds, which is an essential feature for most logos. Use this tutorial to create your own vector image logo. Every website needs a clean professional navigation system. This tutorial for creating button symbols will walk you through designing the functional buttons for your navigation bar or menu. Sketch allows you the freedom of using plugins, automated effects and stacked pages to create 3D-looking buttons for any web project. 10. Create a Sketch Plugin. Plugins are very useful to Sketch designers, they can automate common processes and create repeatable effects throughout varying projects. If you’ve discovered a process you’ve been doing manually and would like to recreate it with a single click then it’s worth taking the time to learn how to make Sketch plugins. Use this tutorial to create a Sketch plugin using a basic JSON file. The Sketch application is easy to use but powerful enough for the most demanding graphic design projects. The best way to learn how to use Sketch is to follow these instructive tutorials to create some practice projects. If you have web hosting and need a layout, template, or graphics for your website then Sketch is great option for you. Once you’ve learned how create effects and design elements with Sketch you will be able to use these concepts to create your own unique graphics.